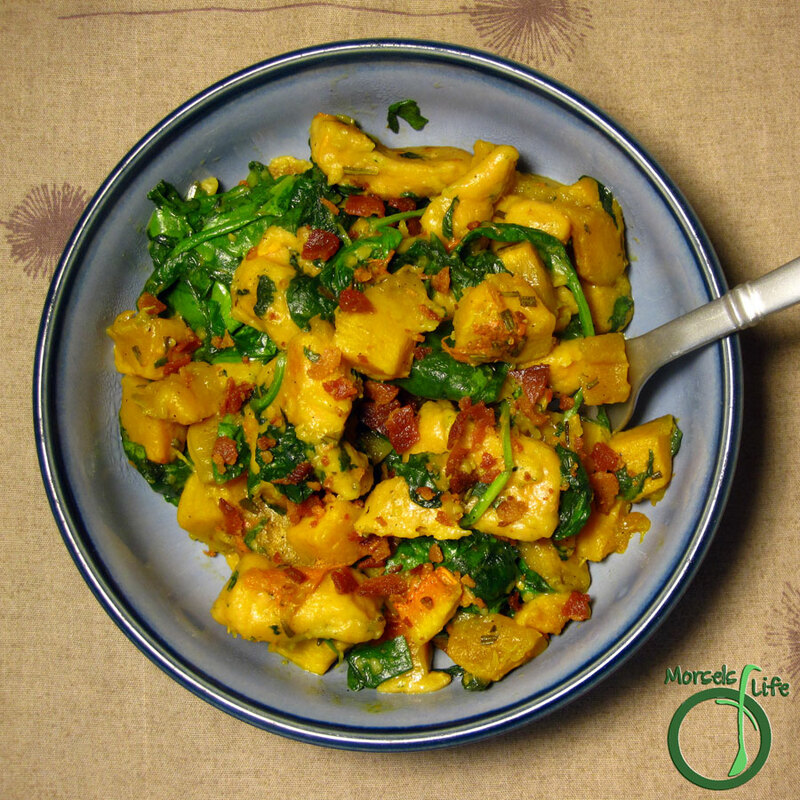 A yummy combination of sweet potato gnocchi, roasted butternut squash, and spinach topped with some crispy bacon. After making some sweet potato gnocchi, I thought about how to serve them. Should I go simple and cook them up like Fettuccine Alfredo or opt for something a bit different? Well, you know me - I always want to try something neeeeew! I'd roasted up some butternut squash with a bit of rosemary for a side, and I had a bag of spinach, so I thought - why not throw it all together and see what happens? I'm happy to report, this combination of roasted butternut squash, sweet tater gnocchi, and spinach really worked out well! (Of course the bacon topping didn't hurt either. :P) It's pretty quick and easy too - just heat the gnocchi and butternut squash and then stir in a bit of spinach. Top with some bacon bits if you're feeling fancy! What are some recipes where you just threw some stuff together and it worked really well? Heat a small amount of oil in a pan and add gnocchi. Add in butternut squash and rosemary. Mix in spinach and cook until wilted. Top with bacon bits and serve. Great stuff! Thanks for calling out to your recipe on sweet potato gnocchi. Awesome, because that's my favorite kind of recipe! Looks delish! Thanks for Linking up at Show Me Your Plaid Monday's! I'm stealing this for my "list of recipes to sneak veggies into my kids without them realizing it". It looks quite promising! Thanks for linking up to Must Try Monday! I love gnocchi! I just learned to love butternut squash. We got about 10 from our fall pick up of our CSA veggies. I had never made them before. I will give this quick and easy recipe a try! Thank you for linking up to In and Out of the Kitchen. I look forward to seeing what you bring next week! This looks amazing, and so easy too! I have pinned it and will be making it soon! I love gnocchi and this seems like the perfect way to make it...healthy & tasty! Yummy! I've used regular potatoes for gnocchi, but not sweet ones.... I love them, so I am now inspired to try this! Pinning. Thanks for sharing at Tasteful Tuesdays this week! YUM! hey - I posted the sweet potato gnocchi in my what to bookmark post - it will be up tomorrow morning.thanks for linking up to Friday Food Frenzy! I love butternut squash this looks good! Thanks for sharing at Foodie Friends Friday. Please take a minute and link back to the party. Thanks!